One sheet of green scrapbook paper for leaves. Download the spiky dahlia template. Follow the template and cut out the specified amount of petals and leaves. After the petal is dry and the wire is securely attached, wrap the bottom corners of the petal around the wire and then wrap with floral tape. 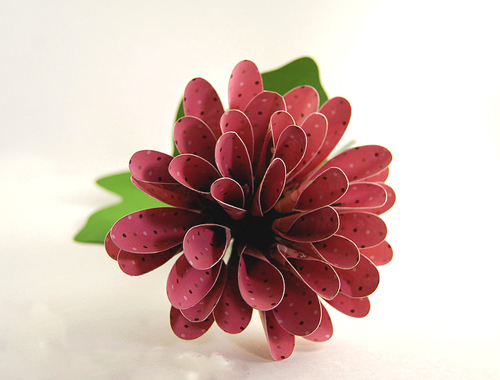 Gather the small petals in a bunch, each petal facing inward, and wrap this bunch with floral tape. Start arranging middle size petals around the small petals as in the photo, and wrap with floral tape. Repeat with large petals on the bottom row. Wrap all the floral wires with green floral tape to make the stem of the flower. Attach leaf to stem with floral tape. Voila! You now have the most beautiful paper flower. Place it in a vase and admire!